I just finished my install on databases and service to our developement server. When creating several databases and several instances I wanted to use PowerShell. I based the setup on the demo database backup and used PowerShell ISE as an Administrator to do the setup. First step is to set up parameters. write-host "Restore of " $DatabaseName "Complete"
$q = "EXEC sp_addrolemember @rolename = N’db_owner’, @membername = N’NT AUTHORITY\NETWORK SERVICE’"
$q = "UPDATE [$DatabaseName].[dbo]. [$tblName] SET [license] = (SELECT [license] FROM [$CopyLicenseFromDB].[dbo]. [$tblName])"
New-NAVServerUserPermissionSet -ServerInstance $ServiceInstanceName -Sid $($_.SID) -PermissionSetId "SUPER"
$q = "EXEC sp_addrolemember @rolename = N’db_owner’, @membername = N’" + "SKYRR\" + $grp + "’"
First step is to initialize all variables. Next step is to restore the database. 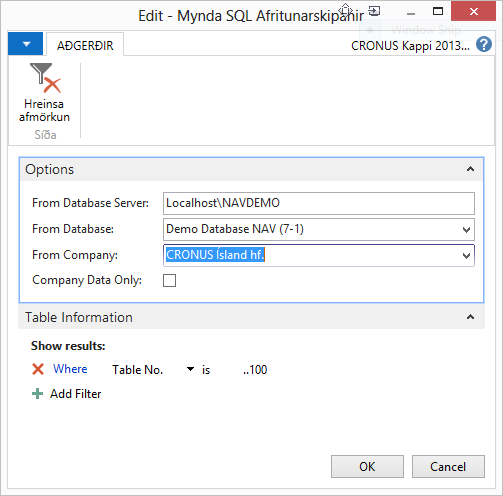 The user running the NAV Server Instance will need to have access to the new database. New NAV Server Instance is created and started. The existing company is renamed to the new company. Use Active Directory to find all users in the developement group and add them as NAV users and give them SUPER permission. The groups are also given ‘db_owner’ permission for the database to be able to run Developement Environment. 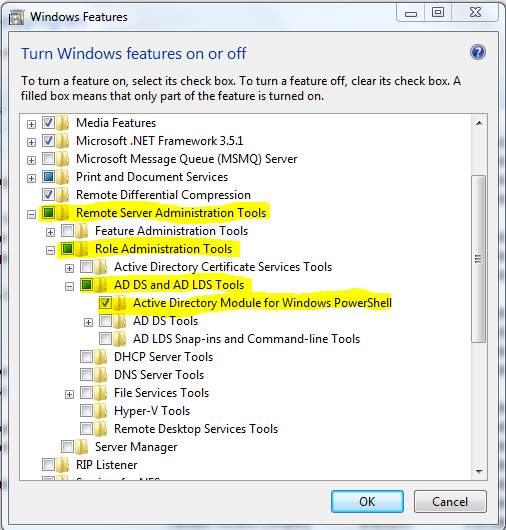 If the Active Directory PowerShell commands are not installed just activate that feature or look here for further details. NAV 2013 R2 is now multi tenant. That means changes for the developer but not for the user. This means that the application can be in one database and the company data in another. One application can contain multiple companies in multiple databases. This means that some of the administration tasks in the Developement Environment (old classic client) have been removed. The whole File->Company section is moved into the Windows Client. In the Windows Client the user can now create, delete and copy companies. The Copy Company function is new and easy to use. The permissions for the database table Company determines what the user is allowed to do, meaning that if a user has the permission to delete a record in the table Company that user will be able to delete the whole company and all its data. Take a closer look at what this means on Mark’s new website. Since the data can now reside in multiple databases and the Developement Environment only connects to the application database the Backup and Restore feature has been removed. No more FBK files. You will now use SQL or PowerShell to do backup and restore. Take a look at Waldo’s website for details. Microsoft is planning to supply a new and easy way for Backup and Restore as Mark has blogged about. Both Mark and Kamil have supplied a scripted way to copy data from one company to another using SQL commands. I published a NAV Report that created SQL commands to copy data. This was prior to NAV 2013 R2 so I decided to update that report and republish here. Some of the update was inspired by Kamil’s work – thanks Kamil. I also use this to copy data from a live database to a developement database and between versions of NAV. 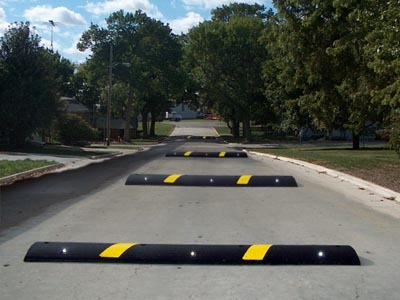 I hope this will help you over some of the speed bumps to save time. Came here to Seattle last Thursday on a holiday with my family. Nice practise for the MVP Global Summit next month. The web site is up again after an unexpected downtime. 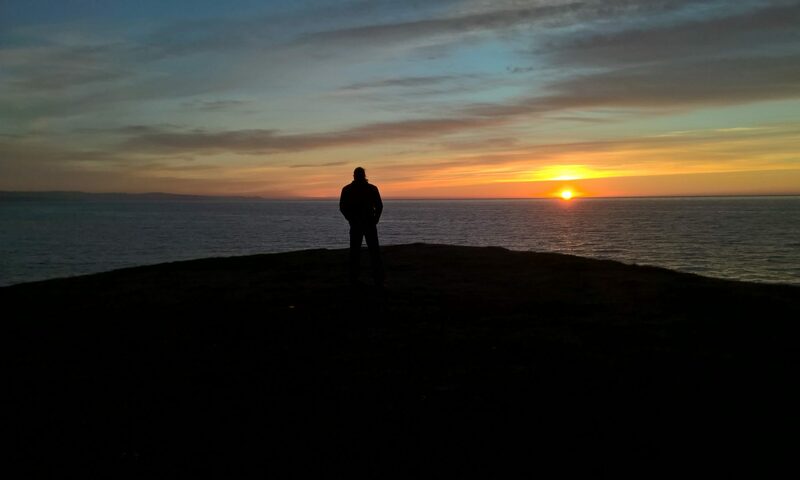 I lost the electricity in my home town for a short time and at the same time I was driving south to Reykjavík for work. I needed my wife to turn on the web server computer in her launch break and that is the first time she has to do that. This is the first downtime I have had on my web site this year. But, you know what ? Being a Microsoft MVP means I get benefits on Windows Azure and can move my web site to a place that will never fail. I already moved my @dynamics.is mail to outlook.com. If you are a user with multiple companies in your NAV database, or even with multiple databases you might be used to switching between companies or servers. I have been asked to create desktop shortcuts for the users. What if the user is acting as a sales person in one company and as an accountant in another. Then there is this confirmation dialog that always requires us to approve the server connection. This is a process that takes time. So, why don’t we let the user do this by him self ? I wanted to so I created the code to make this happen. First I needed to add a function to Codeunit 9500, Debugger Management. and then a small Codeunit to do the magic. And guess what, no confirmation dialogs. By running this Codeunit a shortcut will be created on the user desktop. The shortcut name will be the company name and the profile description. I guess it is not to hard to code the making of shortcuts for the developement environment but I leave that to you. 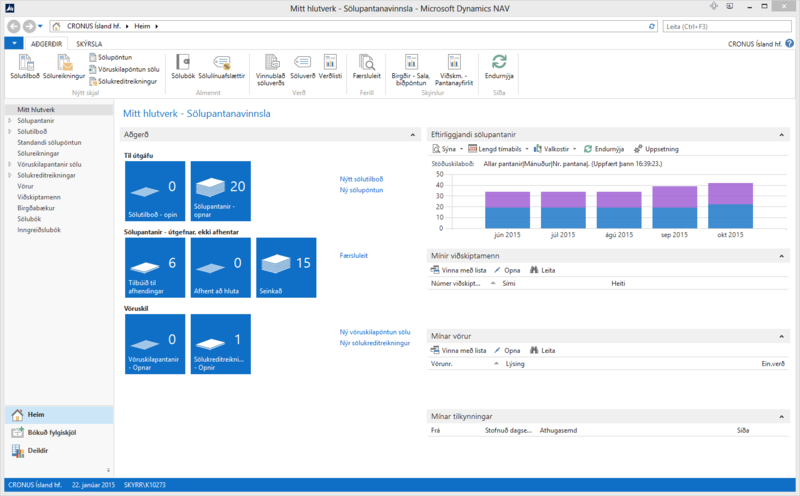 Last Monday Microsoft announced the release of a new major version of Dynamics NAV. On the product download page I am happy to see that my IS localized version is available. It is nice to see that and a big change from the last release where the IS version was not available until May 1st this year, seven months after the global release date. A PDF document is supplied with highlighted new features and download links for all versions. deep commitment to community and a willingness to help others.